I just finished training Barbara and she is the first student coming from the Big Island of Hawaii. Barbara has been an artist for many years and she's been in business for a long time but she wanted a new challenge in her life. She has a great location within a hotel where she already sells her art. On her island of Hawaii, they only have a few people to do airbrush tanning and this is why she decided that it would be a great opportunity for her to learn airbrush tanning and offer it to her local residents and also offer it to the tourists within the hotels. During her training class, we had several models for her to practice on and we also used a variety of spray tanning solutions so she can learn about the different brands and coloring of the different spray tanning solutions. ​I also gave her some great advice on her website and we brainstormed together on a few great names for her business. I can't wait to see what she does with all her new learned skills and excited to hear back from her about her success. During her spray tanning class, I also gave her a spray tan so she could see and feel on how different a spray tan can be. She confirmed that my spray tan did not feel sticky, did not rub off on her clothe and sheets and just felt really amazing on her skin. Hollywood Airbrush Tanning Academy, one of America’s top rated hands-on airbrush tanning training school, is pleased to announce the expansion of the Hollywood Airbrush Tanning Salon. Over the last few years, this academy has helped hundreds of aspiring airbrush tanning professionals start a rewarding career in this field. Hollywood Airbrush Tanning Salon has been launched by the academy with the intention of creating a space where their trained graduates will be able to bring their own clients and serve them independently under their own brand. The location of the Hollywood Airbrush Tanning Salon is the same as that of the training academy. The location has been improved recently by removing an office and constructing another room with professional quality ventilation and air purification systems. These two are considered to be very important factors for airbrush tanning technicians because it extracts the overspray of the solution. Moreover, these enhancements also ensure that the technicians don’t end up inhaling the rest of the solution, especially when doing high volume spray tanning. “I like to provide a clean and sanitary environment for my clients and technicians and this is why I invested in this spray tan extraction booth. In addition, it keeps the room clean and the air healthy and all my clients love this about my environment,” said Simone. Hollywood Airbrush Tanning Academy is located in Los Angeles, California and offers an extensive hands-on Spray Tanning Certification program to individuals who want to start their own full or part-time airbrush tanning business. Founder and trainer, Simone Emmons is a professional spray tanning expert and teacher and has trained over 300 entrepreneurs from 27 states (and counting) including international students from Trinidad, Belgium, Denmark, South Korea, Kuwait and Canada. Simone’s airbrush tanning business has won the “Best of Los Angeles Award 2015” for airbrush tanning in Los Angeles. The airbrush tanning trainingprovided by the Hollywood Airbrush Tanning Academy is private and hands-on and prepares the student to start in business immediately. Prior to the hands-on training, over four hours of videos lessons are provided to students covering everything from safety and technique to marketing and Search engine optimization. Hollywood Airbrush Tanning Academy does not sell any of their own products and provides training and education on all equipment and spray tanning solutions in the sunless industry. 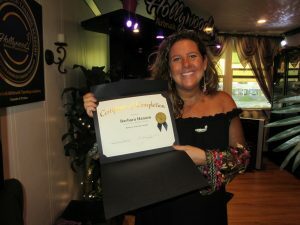 The academy provides hands-on training classes in Los Angeles and Connecticut area as well as online airbrush tanning certification classes.